Plans for a Westwood High student fieldtrip to the Oregon Shakespeare Festival in Ashland prompted an evening fundraiser dedicated to the visual and performing arts. To help cover the cost of the adventure, drama students in a class taught by Cecilia Allin, along with a slew of volunteers, turned the gym at Fletcher Walker Elementary into a dinner theater. 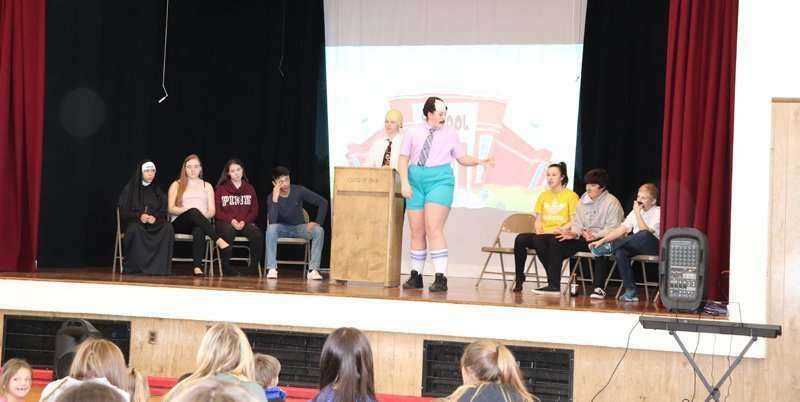 The event Friday, March 22, was titled “A Night of Laugh Out Loud Comedy Skits!” Allin said the students came up with the skits aided by resources such as YouTube. The inspiration for the comedy was varied and included synchronized swimming, a high school sports coach and speed-reading. The actors were Raymond Chappell, Cleta Tirey, Haleigh Meeks, Tyler Melendrez, Justin Boyd, Keyonna Walker, Jade King, Brianna Ortlieb, Jalyn Halcrow and Dayton Duerksen. In-between skits, short films were shown which were created by students in the film/photography class, taught by Molly Barber. Thirteen students and their chaperones will travel to Ashland, May 31 to June 2, to see four plays in three different theatre settings. The festival encourages school fieldtrips and holds workshops to support the student experience and understanding of the plays. Last year the seven students who went to the Oregon Shakespeare Festival attended a workshop to study passages in Othello in order to understand what Shakespeare was saying and explore the main characters of the play. They saw Othello, which was a 3.5-hour performance, in a large theater. Also they saw Henry V in a small, intimate theater seated in the second row, which made the performance very close and personal. According to Allin, enough money was raised at the dinner theater to cover the cost of the tickets, meals and lodging for the 2019 fieldtrip. Sponsors helped raise $3,000 before the event and another $2,000 was raised at the event to reach a goal of $5,000. Sponsors purchasing ads in the program were B&B Booksellers, Buffalo Chips Pizza, Coffee Station, Collins Builders Supply, Holiday Market, Intermountain Enterprises, Lassen Gift Company, Mi Casita Mexican Restaurant, Misty’s Nail Creations, Mom’s Old Mill Café, Mountain Valley Living, Plumas Bank, The Ranch House, The Wire Wizard, To Dye For Hair and Nails and Walker Mansion Inn. Sponsors that include donations to the silent auction are Lisa Bernard, Mr. and Mrs. Altenburg, Charles and Diana Diggs, D&L Rentals, Shards and Splinters, 27th Fire Ministries Reverend Anthony, Chester Smile Family Dentistry and Rotary Club of Susanville. A pork tenderloin dinner was prepared by Patty Bennett and served by students who will participate in the fieldtrip to the Shakespeare Festival but are not in drama as many are enrolled in the film/photography class. Also students wishing to earn volunteer hours helped serve. At the end of the performance Allin recognized two community members for the hours they worked with the student actors on their performances. They were Gail Brown, who participated in the Westwood Theater Company, and Carol Ross, a substitute teacher for Westwood Unified. The afternoon prior to the Dinner Theater elementary students were invited to a preview performance that consisted of a few skits and a song performed by Halcrow and Meeks.